A living sailor uniform Ryuuko finds beneath her house. Senketsu is a Kamui (神衣 lit. "God Clothes"), an outfit that provides its wearer with godlike abilities in exchange for their blood. He has the power to transform into an indestructible suit of armor, albeit with a skimpy appearance, much to Ryuuko's embarrassment. His name, given to him by Ryuuko, literally means "fresh blood." It is later revealed that Satsuki is also able to speak with Senketsu. This is because the Life Fibers he's been absorbing have allowed him to evolve and talk to humans. 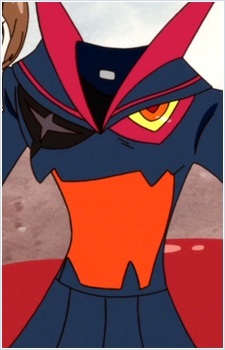 Like Ryuuko, Senketsu is a combination of Life Fibers and a human; only more of the former than the latter. Kill la Kill is the story of Ryuko Matoi, a lone rebel who, along with the super-powered sailor suit Senketsu, takes on the elite Hannouji Academy in search of her father's killer. These 20 quotes recall some of the series' most powerful moments.